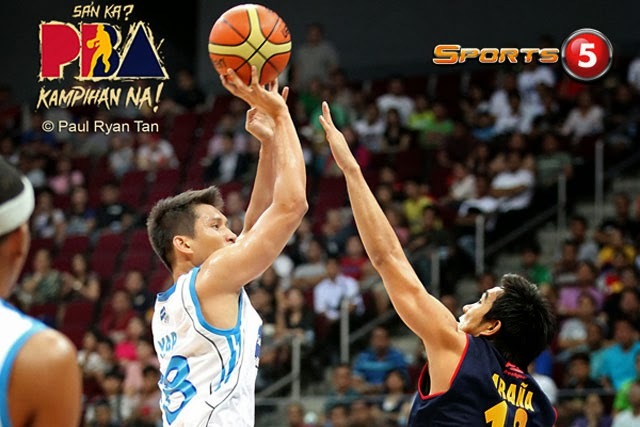 Rain or Shine vs. San Mig Coffee Game 1 Live Blog, Updates, Scores - PH Cup Finals 2014 - Balita Boss! Rain or Shine Elasto Painters, having a twice-to-beat advantage, dispatched the Global Port Batang Pier in the quarterfinals. The Painters finished off the Petron Blaze Boosters in the semifinals 4-1. The San Mig Coffee eliminated the Talk n Text Tropang Texters in the quarterfinals. It took them a full seven games, but the Mixers managed to outlast the Barangay Ginebra San Miguel in the semifinals. The PBA Philippine Cup Finals has arrived. The Rain or Shine is set to face San Mig Coffee in a best-of-seven series. What a nice pass from Gabe Norwood and a nice alley-opp shot by Paul Lee. Nice play Rain or Shine. PBA Astig! Barroca throws an airball; Rain or Shine calls timeout. Still tied game. SMC, Tim Cone calls another timeout. Cruz tied the game with his jump hook. Yap back-to-back baskets give San Mig a two point lead. San Mig still down by two. Chan hits back to back three pointers. Mallari extend the lead to six points. Simon scores to give San Mig a 3 point lead. Putback from Nuyles; Pingris to Reavis for easy 2 points. Hand to hand combat between Rodriguez and Pingris. Barroca used the glass; game tied under 10 minutes. Melton knocks down a jumper; Cruz quickly answers. Barroca beats the 3rd quarter buzzer. Devance scores putback, but Arana quickly answers. Excellent pass from Chan to Cruz easy basket. Devance scores in the post with a tear drop shot. Jeff Chan with a pull up jumper. Tied ball game courtesy of Devance on the break. Belga scores off the glass. Norwood slam dunk. Great pass from Lee. Pingris converts two free throws. Paul Lee shoots from beyond the arc. Layup by Almazan and Yap. Tied ball game. Pingris tied the game with a layup at the halftime buzzer. Belga hits two free throws. Melton drains jumper; Mallari misses two FT. San Mig Coffee down by 3. Devance goes 1/2. Cruz misses both FT.
Jervy Cruz scores putback to start second period. Yap scores fastbreak layup; the score stands at 14-12 in favor of RoS. Belga hits a three pointer. Belga scores the first basket, pass from Norwood. San Mig win the opening tip. PREGAME | Members of the San Mig and Rain or Shine introduced on court.